I love browsing the grocery store to find foods I’ve never used before or to just see what new products are out and how company’s are advertising them. In fact, a friend recently joked that instead of meeting up to go shopping at a clothing store, it was more likely we’d meet up to browse the shelves of the grocery store. A few months ago I was in the yogurt section of a local market that I really like and they had yogurt made from coconut milk. But it wasn’t like the other types of coconut yogurt I’d seen — it didn’t have any added sugar or thickeners and its only ingredients were coconut milk and cultures. Oh, and it was $12.99 for an 8-ounce jar (so, $1.62/ounce). I’m sorry, what? Now, while I love trying new foods and exploring the grocery aisles, I do have a food-related pet peeve and that is companies who make outrageously expensive products that are then touted as being better than the rest and as a result make people feel like it costs a fortune to eat healthfully because you have to use $12.99 coconut yogurt instead of [insert yogurt or milk you’re currently using with your cereal]. Rant over. That said, I’m sure that yogurt was delicious and coconut milk yogurt is a great alternative to dairy yogurt for people who can’t — or don’t want to — eat dairy. Anyway, I thought that there had to be a way to make coconut yogurt at home that would taste amazing, not have sugar or thickeners added, and not cost a fortune. Turns out there is and it is easier than you would ever expect. Like, stirring-two-ingredients-together easy. 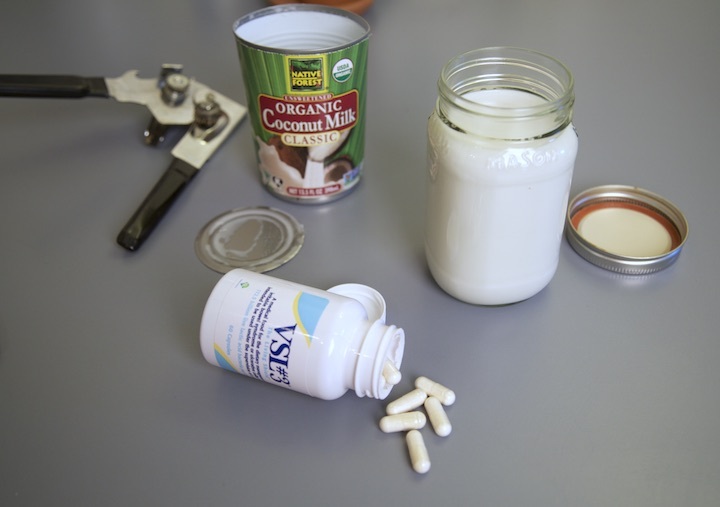 Coconut milk and a probiotic capsule is all you need! I use Native Forest Organic Coconut Milk because they guarantee that their cans aren’t lined with BPA-containing plastic. As for the probiotic, I’ve tried this with a couple different types and they all worked. But, I’d say the VSL#3 variety works the best and results in the best flavor. Again, try it with whatever type you have available. The Native Forest runs $2.35 for a 13.5 ounce can and VSL#3 runs $0.88 per capsule (and some pharmacies will let you purchase a single capsule). So for 13.5 ounces of really delicious homemade coconut milk yogurt, you’re spending roughly $3.25 ($0.24 per ounce). It’s worth mentioning that since this stuff is made with full-fat coconut milk, it’s really rich. So, I don’t use it in the same way that I would a cow’s milk yogurt. I use it more like I would sour cream or creme fraiche. I’ll spread it on peanut butter toast with fruit or drizzle it over French toast, pancakes, or crepes. It’s an accessory to a meal, not the main star. The yogurt after 24 hours…starting to thicken! Without further ado, here’s the coconut yogurt recipe. Oh, one more thing — we also have a video tutorial up on our YouTube account if you’re more of a visual learner. 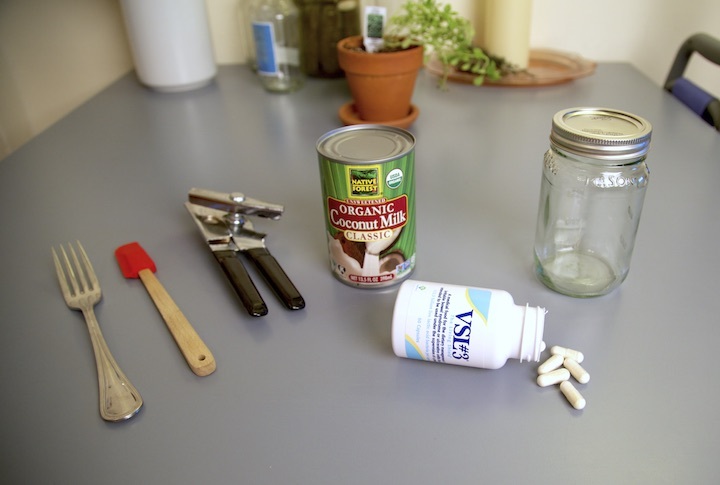 Shake the can of coconut milk very well to ensure that the contents aren’t separated. Pour the contents of the can into a glass jar with a lid. 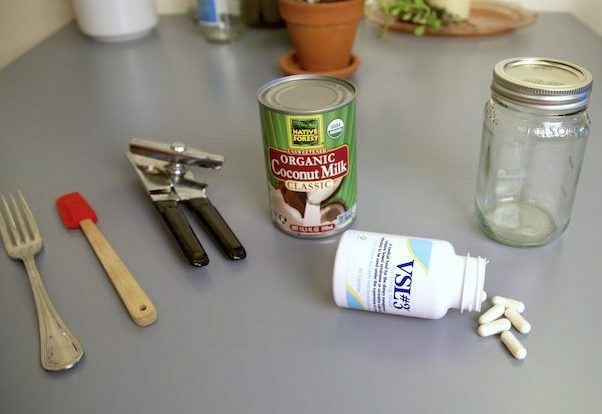 Open the probiotic capsule and pour the powdery contents into the coconut milk. Stir the powder in until fully incorporated. 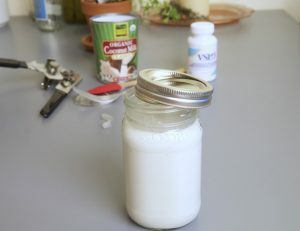 Place the lid onto the top of the jar, but leave it askew so air can reach the coconut milk. Place the jar in a room temperature place where it won’t be disturbed. The back corner of a kitchen counter is where I usually leave it. Wait 24 hours. Stir after 24 hours and taste your mixture. If it’s as sour as you want it and also thickening, place the lid on correctly and store in the fridge. If you’d like the yogurt a little more sour/thicker, let it go another 12 hours and check it again. You can let it go around 48 hours total, but this total time does depend somewhat on the type of probiotics you’re using. 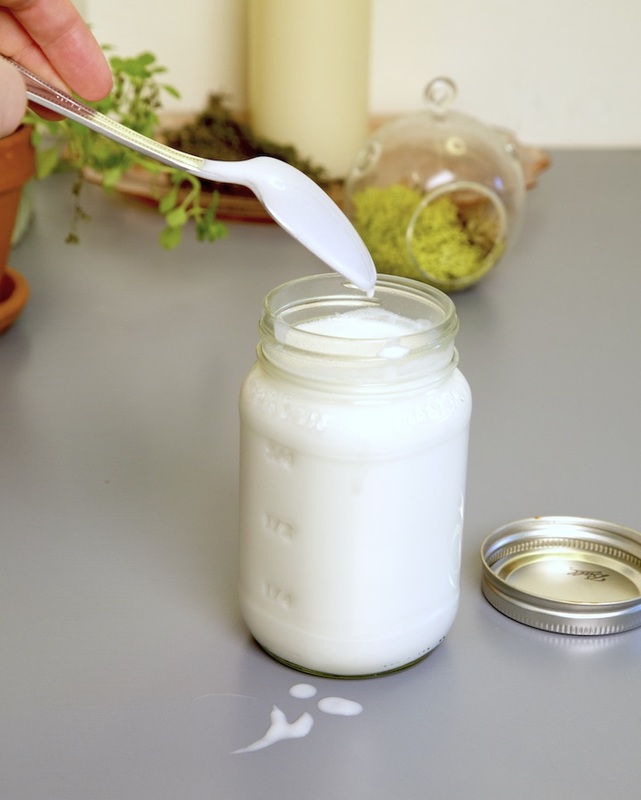 Place the lid on your jar of yogurt and refrigerate. *Note: When you’re left with about 1/4 cup of yogurt, pour a new can of coconut milk in, stir it up, and let it sit on the counter for another 24-48 hours to culture your new batch. 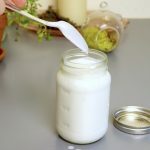 You don’t need to use another probiotic capsule for subsequent batches as long as you save some of your current batch of yogurt to use as your culture. If I have just the powdered bed not in a capsule. How much should I use? Hi Jamie! We haven’t used the non-capsule kind before but would say that using the amount in one serving is probably a good place to start. Since one capsule is one serving, we’d guess that whatever amount the company puts on the package of the loose powdered versions as one serving would have similar effects on the coconut milk! Will you let us know how much you end up using and how it turns out? This yogurt tastes soooo good! And after you make one batch you can add more coconut milk to make more. Glad you’ve had good luck with the method. It’s so cool how simple it is….and ya, once you make one batch you don’t have to use any more probiotic capsules! Hi! Sometimes it doesn’t thicken up until you put it in the fridge and some batches just don’t thicken. 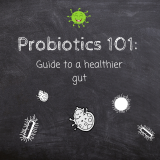 The type of probiotic can make a difference, as can the temperature/time of year. We’ve had the best results with VSL #3 probiotic and when we make batches from a previous batch (i.e. 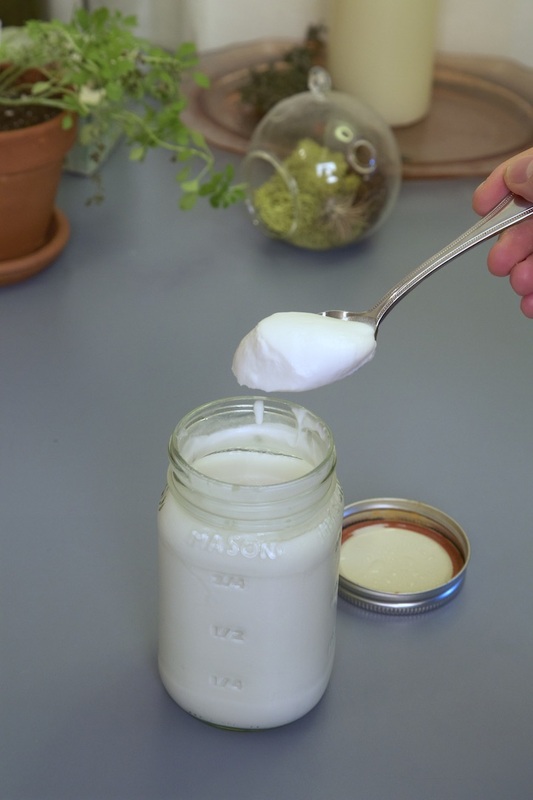 instead of using a new probiotic capsule we stir 1/4 cup of a previous batch of yogurt into the new jar of coconut milk) we get the thickest yogurt. We’d recommend trying to put it in the fridge and seeing if it thickens a bit and how the flavor is. If the flavor is good, you might try using 1/4 cup of that yogurt to make your next batch. 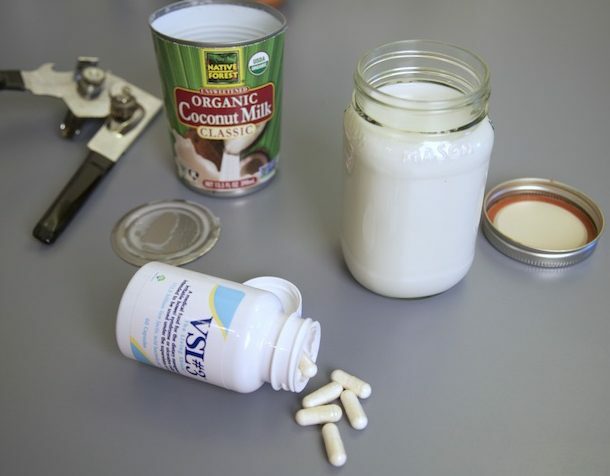 If the flavor is off, you might try a different probiotic. Keep us posted…and good luck! Thank you for this recipe/method. It’s the only coconut yoghurt that has been successful for me. Easier than making your own dairy milk yogurt. 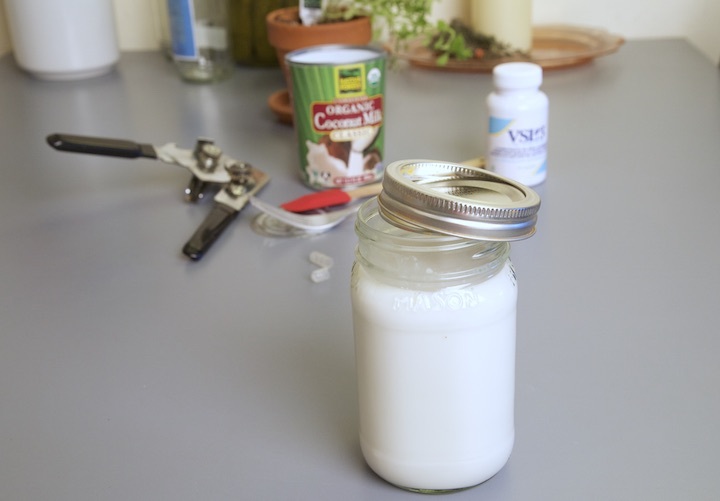 Have you tried this method using a low fat coconut milk? We haven’t! If you try it will you let us know how it turns out? How can this be used to make dairy free salad dressing or other sauces? 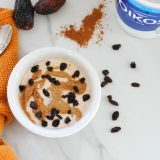 You can substitute this yogurt in ounce for ounce for dairy yogurt in most recipes. It’s great as a substitute for creamy dressings like Ranch, etc. When using it in sauces, it does thin out a bit once it’s heated, but definitely adds creaminess and body to sauces. We’d love to hear what sauces/dressing recipes you try it in! We also love using it in baking in place of dairy yogurt. We’ve tried it in scone recipes and it’s GREAT! you think this will work with the simple version of native forest coconut milk that doesn’t have guar gum? Also can i use whole milk from trader joes with active cultures as a starter? Hi! We use the plain Native Forest and it works great. As for using dairy products to make this — we haven’t tried it but someone on our YouTube channel told us they didn’t have great luck with it. The bacteria that eat the dairy sugar may not like to feed on the coconut sugar. Keep us posted? I use “culinary” coconut milk that comes in “paper” box to avoid can liners. Generally it’s pretty thick! Should I cut it with water first? Hi! Yum — the culinary coconut milk should be able to be used as-is as long as it’s not coconut cream. We’d try it as-is first and see how the yogurt turns out (it will probably be nice and thick and delicious). 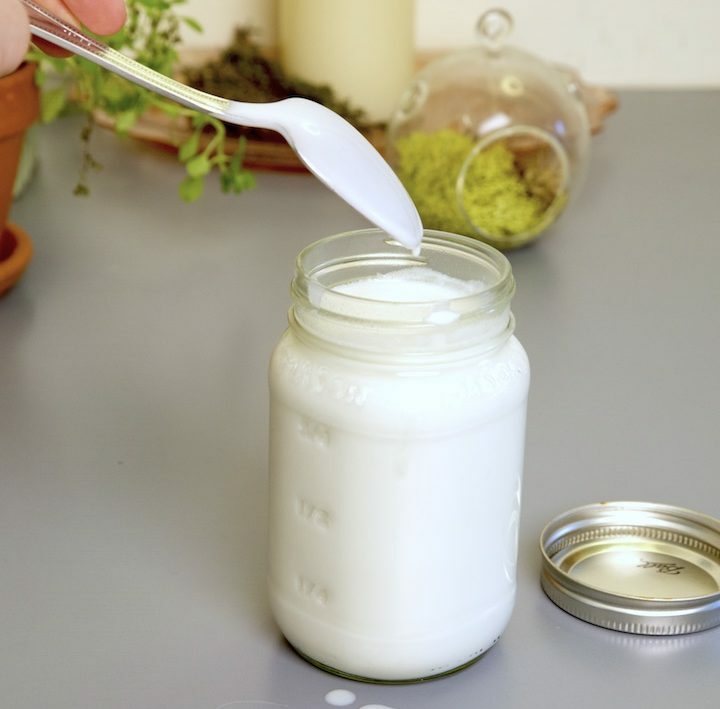 If the yogurt is thicker than you’d like it to be, you can stir in a little water or coconut water after it’s already cultured. Will you let us know how it turns out? What would you consider room temperature to be for the yogurt to sit in? Mine is still watery after two 24 hour periods. Also, it has a grainy taste. Help! Hello! Let’s start trouble shooting! Honestly, we have some batches that just don’t turn out as great as others — that happens with fermentation. But, it sounds like yours might benefit from heading into the fridge (which should thicken it up). Was the flavor good? If the flavor is nice and sour like yogurt, try sticking it in the fridge and seeing if it thickens. We’ve found that graininess is usually a variable of the coconut milk. Our estimate of room temp is anywhere from 70-85 degrees, depending on season. The other variable is the probiotic. We’ve definitely found that the VSL #3 probiotic makes a thicker yogurt but we’re often surprised at how much it can thicken up in the fridge, too. Hope this helps. Will you keep us posted? I have gotten to the stage of having my yogurt in the fridge for about 24 hours now and it’s still runny. Is there anything I can do to salvage this or, do I just start over with a new can of coconut milk and probiotics? Hi! 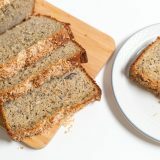 A runny texture doesn’t necessarily mean the batch didn’t work — it could just be that because it’s summer it stayed a little runnier. If the flavor is good, then you can use it like a European style yogurt/kefir. If the flavor is off, then something must have thrown the bacterial balance off (it happens!). We had a batch recently that turned out a little runnier than usual but still had good flavor! Keep us posted? I’ve never had coconut yogurt before and I can’t buy it where I live. So I’m not sure if it’s off or not. It tastes something like sour cream. It doesn’t taste like rancid milk smells. So hopefully that’s a good sign lol. I’m going to try again and what my luck brings:). Thank you for responding!! If it tastes like sour cream that sounds right! It should be a sour yet smooth flavor. Definitely don’t want it to taste like rancid milk smells so that’s a good sign that it doesn’t! 😉 Keep us posted on batch #2!! 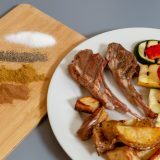 Hi, I’ve been making this recipe and it has been amazing! 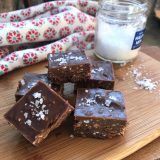 Could you tell me the best way to do a double batch? Awesome! We are so happy you like this recipe…it’s a staple in our fridges, too! We actually just made a double batch and it turned out great. Used a larger jar and two cans of milk and 3 probiotic capsules. You could probably do it with one capsule, too, it would just take a bit longer to culture. We tasted it every 6 hours after the first day and stuck it in the fridge when the flavor was sour enough. Ours took about 2 days total, but it will definitely vary depending on temperature and probiotic. Let us know how it goes!